The prophecy Davian's people had forgotten has been fulfilled; Elysia is now slave to a tyrant. 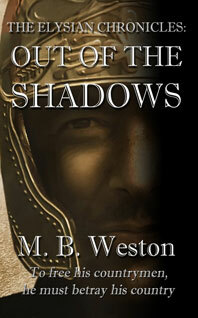 His mercenaries, the dreaded Black Guard, kill at will, casting a shadow of terror wherever they tread. Elysia's enemies, the mornachts, have overrun Earth, and the human child prophesied to rid evil from both worlds may not survive their attacks-or impending world war. Elysia's only hope for freedom lies in Davian. Once a decorated officer, Davian now roams Elysia's outskirts as an escaped fugitive. Armed with only a stolen sword, he and three loyal soldiers vow to somehow return to Elysia through a wilderness full of mornachts, Black Guard, and a nameless evil that slithers in the darkness, watching Davian's every move. For Davian to succeed, he must gather an army and somehow convince the neutral races of dragons, unicorns, and gnomes to help him along the way. The closer Davian gets to Elysia, the more one thought haunts him: To free his countrymen, he must betray his country.